Turkish solders stay with weapons at Taksim Square as people protest against the military coup in Istanbul, July 16, 2016. Below is a timeline of breaking events in Turkey. All times in GMT, based on the times Reuters reported the events. Reuters does not vouch for events reported by other media. 0100: Turkey's President Recep Tayyip Erdogan appears among supporters at Istanbul airport, says uprising has been attempted against solidarity and unity of country; says no power is above national will. 0045: Around 30 soldiers, part of faction attempting to carry out a military coup, surrender weapons after being surrounded by armed police in Istanbul's central Taksim Square. 0045: Turkish private broadcaster CNN Turk halts live news broadcast; presenter says soldiers entered studio control room. 0027: Two more explosions hit parliament; member of parliament reached by telephone says lawmakers are hiding in shelters at the parliament. People demonstrate outside Ataturk international airport during an attempted coup in Istanbul, Turkey, July 16, 2016. 0020: Turkish official says Erdogan's plane lands in Istanbul. 2352: Turkish Prime Minister Binali Yildirim says situation under control, blames U.S.-based cleric Fethullah Gulen movement, and declares no-fly zone over Ankara. A U.S.-based organization close to Gulen earlier denied involvement. 2339: Bomb hits parliament in Ankara, state-run Anadolu Agency says. Reuters witness hears blast in Istanbul. 2320: U.S. Secretary of State John Kerry emphasizes "absolute support for Turkey's democratically elected, civilian government and democratic institutions" in phone call with Turkish foreign minister. 2313: Group close to U.S.-based cleric Gulen says accusations it was involved in coup attempt are "highly irresponsible." Condemns military intervention in Turkish politics, expresses concern about safety of citizens. 2305: U.S. President Barack Obama says he and Kerry agree that all parties in Turkey should support elected government. Urges restraint, avoidance of bloodshed in White House statement. 2304: State-run Anadolu Agency says 17 police killed at Ankara special forces headquarters; no independent confirmation. 2259: Turkish fighter jet shoots down military helicopter used by coup-plotters over Ankara, broadcaster NTV says. 2251: Commander of special forces says a group has engaged in treason, but they will not succeed; adds military does not condone coup. 2247: Prime minister says gangs and illegal formations are behind coup attempt, and calls it a terrorist act. He says government remains in charge, and urges people to take to the streets. An injured woman draped in a Turkish flag is checked by others near military headquarters in Ankara, Turkey, July 16, 2016. 2237: Commander of Turkey's First Army, part of land forces responsible for Istanbul and other western areas, said those attempting a coup were a small faction and "nothing to worry about." 2226: Two loud explosions heard in center of Turkish capital. 2208: Tanks surround Turkish parliament building, and open fire. Gunfire heard at Istanbul airport. 2203: Turkish justice minister says members of a movement loyal to Gulen in the army are behind the attempted coup. 2151: A military helicopter opens fire over the Turkish capital Ankara; witnesses report an explosion in the capital. 2135: Turkish state broadcaster TRT goes off air, but later starts broadcasting from London. 2126: Erdogan urges people to take to the streets to protest against what he describes as a coup attempt by a minority faction within the military. Speaking to a CNN Turk reporter via a cellphone video link, he says it will meet a "necessary response." He says he is returning to the capital Ankara. 2122: Turkish prime minister says on Twitter that everything possible will be done to put down coup attempt, even if it means fatalities. Says sieges are under way at some important buildings, without specifying, but urges people to remain calm. 2118: Presidential source says president and government are still in power. 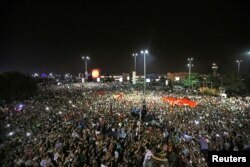 2105: Turkish state broadcaster says — reading statement on the orders of the military — that new constitution will be prepared, government guilty of eroding democratic and secular rule of law, the country is being run by a "peace council," martial law imposed, and curfew imposed across the country. 2102: Head of Istanbul branch of Turkey's ruling AK Party says soldiers enter party building, tell members to leave. 2058: Soldiers are inside buildings of Turkish state broadcaster TRT in Ankara, TRT correspondent tells Reuters. Turkish military block access to the Bosphorus bridge, which links the city's European and Asian sides, in Istanbul, Turkey, July 15, 2016. 2057: Facebook, Twitter, YouTube and other social media restricted in Turkey, say internet monitoring groups. 2049: Turkish presidential source says statement made on behalf of armed forces was not authorized by military command. 2047: Turkish chief of military staff among hostages taken at military headquarters in Ankara, says state-run Anadolu agency. 2038: Erdogan is safe, reports CNN Turk. 2025: Turkish military says it has taken power to protect democratic order. In a statement sent by email and reported on Turkish TV channels, the military says all of Turkey's existing foreign relations will be maintained. 2002: Turkish prime minister says attempted coup under way, and calls for calm. He says a group within Turkey's military has attempted to overthrow the government and security forces have been called in to "do what is necessary." 1950: Gunshots are heard in Ankara, military jets and helicopters seen flying overhead. Helicopters seen overhead in Istanbul. 1929: Istanbul's Bosphorus Bridge and Fatih Sultan Mehmet Bridge are both closed. Dogan News Agency footage shows cars and buses being diverted.